We investigate the current–voltage relationship and the temperature-dependent conductance of nano-scale samples of poly(dA)–poly(dT) DNA molecules. A polaron hopping model has been used to calculate the I–V characteristic of nano-scale samples of DNA. This model agrees with the data for current versus voltage at temperatures greater than 100 K. The quantities G 0 , i 0 , and T 1d are determined empirically, and the conductivity is estimated for samples of poly(dA)–poly(dT). The foundation of all known life, deoxyribonucleic acid (DNA), performs the fundamental task of storing an organism’s genetic information. In recent times, however, it has attracted attention due to its possible applications in biotechnology and nano-electronics . Of particular interest to scientists is the nature of charge transport in DNA molecules, a topic surrounded by significant controversy . The idea that a DNA molecule could be treated like a semi-conducting nano-wire originated with Eley and Spivey, who performed experiments on the DC conductivity of DNA molecules in the dry state . More recently, there has been substantial interest, both experimental and theoretical, in the study of charge transport in this important biomolecule [4–14]. This study investigates the electric field dependence of the conductivity of nano-scale (~100 nm) samples of poly(dG)–poly(dC) and poly(dA)–poly(dT) (uniformly sequenced) DNA at fixed temperatures in an attempt to better understand the precise nature of the charge transport mechanism. Experiments performed by Yoo et al. measured the electric field dependence of the current through samples of poly(dG)–poly(dC) and poly(dA)–poly(dT) DNA. They used molecules with lengths ranging from 0.5–2.9 μm, which were then folded to a maximum length of 100 nm and suspended between Au/Ti electrodes spaced 20 nm apart. Conversely, efforts by Kleine-Ostmann et al. reveal that water does indeed have an effect on the conductivity of DNA molecules. Their experiment measured the current–voltage characteristics of single- and double-stranded herring DNA at three different values of relative humidity. They demonstrate that at high relative humidity, the conductivity of their DNA samples is similar to that of distilled water and accredit this to the hydrolysis of a thin film of adsorbed water . The work of Kutnjak et al. on calf-thymus Li-DNA displays a non-linear current–voltage relationship similar to that described in , although the base pair sequence is not uniform in this case and the samples are macroscopic. The voltage dependence of the current in their samples was studied at 75% relative humidity . Kutnjak’s et al. also measured the temperature dependence of the conductivity of their samples at 75% relative humidity and dried in a vacuum. Their results indicate a decrease of nearly one order of magnitude in the conductivity in a vacuum while the activation energy increased by approximately 0.15 eV, based on the Arrhenius model they used to explain their curves. They attribute this relatively large change in conductivity to an electric field-induced increase in the number of charge carriers. Lastly, an attempt was made to explain this behaviour with a variable range hopping model. Using a ½ power law, Kutnjak et al. found the model fit their data well for temperatures below 220 K.
Although there is significant controversy over the manner of charge transport in DNA, with some experiments indicate that DNA acts more like an insulator  or that the charge migration is strongly assisted by an adsorbed layer of water molecules , there is evidence that DNA generally behaves like a semiconductor. Roy et al. performed experiments on DNA molecules covalently bound to coaxial single-walled carbon nanotubes attached to Au/Ti electrodes spaced approximately 27 nm apart and found a non-linear current–voltage relationship as well. They were able to measure a gate voltage bias effect on this relationship and determined that their samples of avian influenza genes behaved as p-type semi-conductors . This observation is in agreement with Yoo et al. who showed their samples of poly(dG)–poly(dC) DNA were also p-type semi-conductors. Conversely, it has been shown that poly(dA)–poly(dT) DNA behaves like an n-type semiconductor . The lower oxidation potential of GC base pairs leads to the localization of holes [4, 9], which allows the formation and hopping conduction of polarons. We consider that charge carriers are localized on a base pair and interact with phonons generated by motions in the double helix. This interaction leads to the formation of a localized polaron, whose states are distributed randomly in energy and space coordinates . Polarons move throughout the DNA molecule by random hops in this “hopping” space. The transition rates for these polarons are calculated based on the work of Emin . The recent work of Singh  develops a theoretical approach to the phonon-assisted hopping conduction mechanism of polarons in DNA, based on the general molecular crystal model employed by Triberis and Friedman . By treating DNA as a quasi-one-dimensional molecular crystal, a 2/3 power law for the temperature dependence for the conductivity is developed and is found to agree well with the experimental results of Kutnjak et al. [2, 6]. In this study, we extend the work of Singh  to develop a model to explain the non-linear current–voltage relationship for poly(dG)–poly(dC) and poly(dA)–poly(dT) DNA molecules, using a 2/3 power law for temperature. A good agreement is found between the model and data obtained from Yoo et al. . The 2/3 power law is used to obtain the fitting parameter Td, which contains information about the density of states in the DNA, from the temperature-dependent conductance. This value is, in turn, used to find the characteristic current i 0 and temperature-dependent polaron hopping distance a from the I–V curves of poly(dA)–poly(dT) at 143, 161, and 223 K. We find that our analysis yields a linear hopping distance in temperature. A molecule of DNA is composed of pairs of nucleotides. Each nucleotide is itself made of three main components. A sugar (deoxyribose) and phosphate ion combine with one of four amino acids. These are guanine (G), cytosine (C), adenine (A), and thymine (T). Nucleotides form pairs in such a way that those consisting of guanine only bond with a nucleotide containing cytosine. Similarly, adenine only pairs up with thymine. These nucleotide pairs are then stacked to produce a double-helix structure, with deoxyribose forming the backbone of the molecule and the amino acids forming base pairs. Due to the stacked nature of the nucleotides, there is an overlap of the molecular orbitals of the base pairs in the direction parallel to the long axis of the DNA . This is thought to facilitate charge transfer along the base pair sequence of the molecule by allowing a charge carrier to exist in a delocalized state . It is believed that there are two primary modes of long-distance charge migration. One is a coherent tunnelling process whereby a charge carrier is transferred from a donor to acceptor without exchanging energy with the DNA molecule itself . The effect of this method is thought to be minor over sufficiently long distances at the temperatures commonly encountered in experiment [1, 5–9]. The second is an incoherent multi-step process where a charge carrier on a base pair is localized and interacts with phonons in the molecule, which are generated by thermal and twisting motions of the double-helix, forming a phonon [1, 2]. 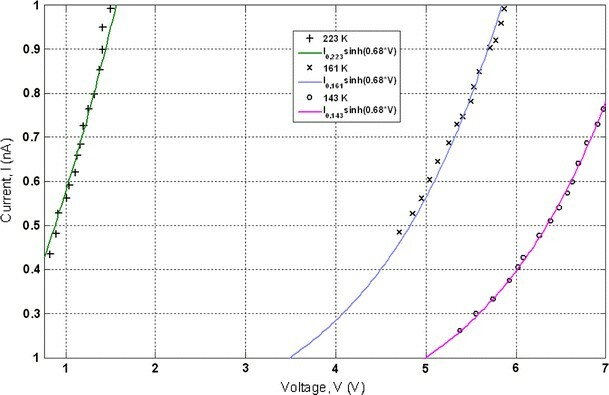 Here, q is the elementary charge, a is the localization length, N0 is the number density of hopping sites, D d is the density of states, and d is the spacing between the electrodes in the experiment (d = 20 nm in the case of ). The 2/3 power law was obtained using the polaron variable range hopping mechanism in DNA . It is considered that the charge carriers are localized at the bases in DNA. The H-bonds and pi–pi bonds between the bases couple the two strands together. The electron orbitals of bases overlap quite well with each other along the long axis of the DNA. The charge carriers are localized on bases due the disorder in the system and strong thermal fluctuations in these structures. The interaction between localized carriers and phonons create polarons which are responsible for charge conduction in DNA due to the variable range hopping mechanism. Therefore, the DNA structure is ideal for electron transfer due to hopping mechanism. The parameters G 0 , γ, and T d can be obtained from experiments. See Figs. 1 and 2. Experiments performed by Yoo et al. measured the current–voltage characteristics of poly(dG)–poly(dC) and poly(dA)–poly(dT) DNA as well as the temperature dependence of their conductances at zero voltage. They found that as temperature decreased, the behaviour of the current in poly(dA)–poly(dT) DNA became increasingly non-linear, and temperature independent at temperatures below 50 K . In this discussion, we compare our model, based on that discussed in  and the earlier work of Singh , to the current–voltage relationship for poly(dA)–poly(dT) DNA at 143, 161, and 223 K. There is good agreement between our model and the data obtained from Yoo et al. We have used Eq. 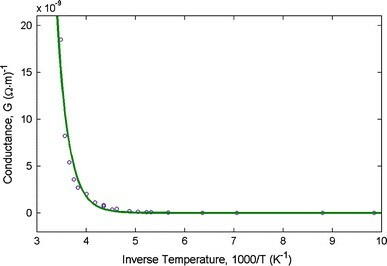 4to calculate the temperature-dependent conductance, which is compared to experimental data to determine the value of T d for poly(dA)–poly(dT) at temperatures >100 K. Figure 1 displays the conductance versus inverse temperature (crosses) and the solid curve representing Eq. 4, which is used to fit the data. The fitting parameters G0 and T d were found to have the values of 78.05 Ω−1 and 3.030 × 104 K, respectively. It is difficult to estimate the conductivity of the sample in , due to the absence of the precise dimensions of the samples used. Assuming the samples have lengths on the order of 10−8 m and cross-sectional areas of ~10−16 m2, we find the quantity σ0 = G0l/A to have a value on the order of 107 (Ω cm)−1. The value of T d agrees within an order of magnitude of the values of 6.7 × 104 and 1.07 × 105 K presented by Singh . However, those values correspond to non-uniformly sequenced samples of DNA and, as such, only serve as a guideline. We use the T d obtained in Fig. 1 to determine the fitting parameters for the I–V curves presented in Fig. 2. By letting I0,T = i0 exp[−(T d /T)2/3], we are able to determine i0 using the 2/3 power law for the polaron hopping model developed by Singh . With this expression, we find i 0 to be 3.65 × 104 A at 143 K, 6.87 × 103 A at 161 K, and 2.36 × 102 A at 223 K. A decreasing trend in temperature for the scaling factor σ0 is predicted by Singh , which corresponds to our i0. The parameter γ takes the value of 0.68 V−1 for poly(dA)–poly(dT) at the temperatures in question. The value of this temperature-independent parameter was obtained by Yoo et al., who offer little explanation for this choice. Nonetheless, there is good agreement between the model and experiment. From Eq. 5, we find the value of α is 2.34 × 10−2 Å/K. The corresponding values of a for each of our fits at 143, 161, and 223 K are, respectively, 3.35, 3.77, and 5.23 Å. Further study will yield a better understanding of charge transport in DNA molecules and the relationship between temperature and polaron hopping distance.